We are offering a limited number of positions to individuals with management potential and a commercial mindset. Successful applicants will join our pipeline of managers across the world who will lead the transtormation of ISS. Starting in September 2019, our intensive programma will position you tor an immediate managerial role, providing you with an excellent understanding and skills within operations, customer partnerships and strategy. From day one, you will be allocated a high-profile member of our executive management team as your personal coach and mentor. You will then work through tours of duty in our largest areas of operation and leadership development activities at a local, regional and global level. During the programme, you will go through a three-month international placement where you will be placed at a different country and get insight into our global footprint. Once you have completed the 18-month programme, our aim is to offer you a management position. Our long-term expectation is that you will move into a senior manager role. You have a business-related degree and some work experience, either from an internship or a job during your studies. You see your future within executive management and are ready to invest time and effort in your career. As a person, you enjoy a complex challenge and demonstrate the right analytica!, decision making and executive potential tor supporting customers in their business development. Your ambitious mindset is balanced by your respectful and empathetic attitude towards the people around you.You are also a strong communicator- in both written and spoken Dutch and English - and you acknowledge the need to walk the talk in terms of company culture, and values. Expect a challenging recruitment process - and a responsible workplace, you will be a part of ISS Netherlands and, during the programme, will report to a director or one of our large accounts. We offer good terms of employment, engaged management and attractive development possibilities. Apply for this great experience! 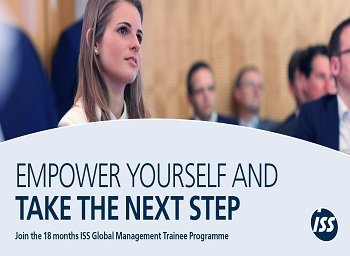 lf you wish to join the ISS Global Management Trainee Programma, you should prepare for an intensive recruitment process. You will meet highly professional recruitment specialists and managers, who will support your learning and personal development. The process culminates at our assessment centres in May, where our country managers and other key executives will participate as assessors. Apply (in English) before 15 February 2019 and send your motivation and CV to recruitment@nl.issworld.com. lf you have any questions, please contact Floor Reurslag, phone: +31624859972. Follow the Trainee Programme on www.trainee.issworld.com or on lnstagram under the account: TRAINEES_ISSWORLD or using the #ISSTRAINEE.